The only thing that leaves art scholars more befuddled than Johannes Vermeer’s shadowy life, is his last and most universally hated painting, Allegory of the Catholic Faith. Like many other great artists, Vermeer didn't ascend to superstardom until after his death. Many of his paintings found refuge in various nooks and crannies of the Northern European art market, waiting patiently to be rediscovered. Fast forward to the 19th century and Vermeer takes his place as one of the most highly respected artists of all time. Highbrow art historian Dr. Abraham “the Pope” Bredius—former director of the Mauritshuis museum and #1 Vermeer fanboy—serendipitously discovered Allegory of the Catholic Faith in a Berlin art gallery. Turns out that Bredius’ alter ego as art history’s Sherlock Holmes equipped him with a keen eye, as he recognized Vermeer’s unique style despite an FBI worthy disguise: the painting originally bore the signature of Caspar Netscher but was ultimately thought to be the work of another Dutch genre painter, Eglon van der Neer. Needless to say, this wasn't the gem that Bredius was hoping for. Describing it as a, “very large but unpleasant Vermeer,” he did everything in his power to pass it off on loan to museums, like a gaudy hot potato. The problem was that everyone else also hated his “one mistake,” as it was dubbed by art historian Arthur Wheelock. Besides the fact that it more closely resembles a melodramatic portrayal of Romeo and Juliet's ending scene (with Romeo played by the snake bleeding out in the corner), the harsh critiques refer to the fact that the clunky religious tableau was a departure from his usual refined, domestic subjects a la Girl with the Pearl Earring or The Milkmaid. Let's just say that Scarlett Johansson won't be playing this leading lady anytime soon. Vermeer converted to Catholicism in order to appease the mother of a woman he wanted to marry. Protestantism was all the rage in the 17th century Dutch Republic, making Catholicism an unpopular minority. As such, devotees were forced to do their worship in makeshift chapels inside homes. This painting was likely commissioned for one of these "hidden churches," which allowed him to take inspiration from one of his more famous interior scenes, The Art of Painting. Well, more like he reproduced it brushstroke for brushstroke, only replacing the original figures with a half-hearted rendition of an Annunciation-style Virgin Mary who has all the acting chops of a daytime soap opera star. We’re onto you, Vermeer! Oh, and did I mention that the painting in the background is the work of another artist, Jacob Jordaens, that Vermeer borrowed (and by borrowed I mean stole), freely editing out some of the original figures to suit his needs? I'm guessing copyright laws weren't that great back in the 1670s. In the end Bredius ended up selling the piece for $300,000 to an unwitting American art collector. That’s roughly 3.8 million bucks in today’s dollars. A Vermeer is a Vermeer, after all. Dolnick, Edward. The Forger's Spell. New York, NY: HarperCollins, 2008. Fernandes, Andréa. "Feel Art Again: "Allegory of the Catholic Faith"." Mental Floss. November 01, 2007. Accessed June 21, 2017. http://mentalfloss.com/article/17284/feel-art-again-allegory-catholic-faith. 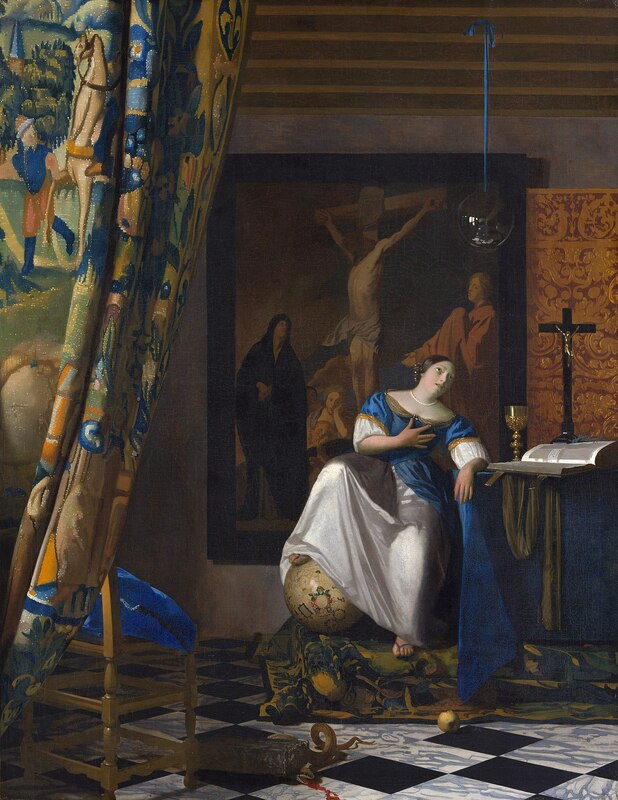 "Johannes Vermeer | Allegory of the Catholic Faith | The Met." The Metropolitan Museum of Art, i.e. The Met Museum. Accessed June 20, 2017. http://www.metmuseum.org/art/collection/search/437877. Kaldenbach, Kees, Dr. "Vermeer: Allegory of Catholic Faith, an exploded view." Johannes Vermeer, Allegory of faith, exploded view, Metropolitan museum of Art point by point explanation. Accessed June 21, 2017. Liedtke, Walter A., Michiel Piomp, and Axel Rüger. Vermeer and the Delft school. New York: The Metropolitan Museum of Art, 2001. Montias, John Michael. Vermeer and his milieu: a web of social history. Princeton, NJ: Princeton University Press, 1989. This and Art of Painting are his only works that fall under history painting in the contemporary hierarchy of genres, though they still have his typical composition of one or two figures in a domestic interior. (The Art of Painting is Vermeer's only other allegory, painted earlier than Allegory of Faith.) Both share several features: the perspective is almost the same, and at the left of each painting is a multicolor tapestry pulled to the left to disclose the scene. The Art of Painting also uses symbolism from Cesare Ripa (of Clio, muse of history). Vermeer's Love Letter uses the same or a similar gilt panel. The Allegory and The Art of Painting differ markedly in style and purpose from Vermeer's other works. Both allegorical paintings show complex meaning, but Allegory of Faith "reveals that the artist's usual focus on naturalistic effects was a stylistic option, to be set aside when the subject called for another approach".The Art of Painting still reads as a naturalistic depiction of an artist and his model, and the pose of the model is simple, whereas the pose of the figure in The Allegory of Faith is Baroquely dramatic. Check out the full Wikipedia article about The Allegory of Faith.